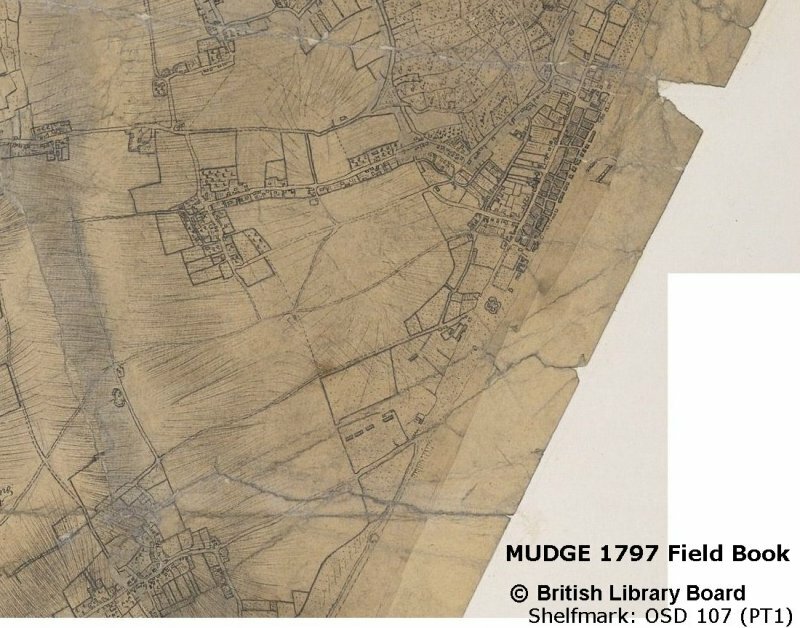 William Mudge, (biographical details) surveyor from the Ordnance Trigonometrical Survey and his team, surveyed the area in the years before 1797 and produced the first accurate large scale map (3 inches to 1 mile) of this area. This survey was national and became the Ordnance survey first edition published in 1820's. From his work we have the original field book sketches of 1797 available at the British Library online gallery. It does show individual buildings, boundaries and an attempt at land use. Marsh area has been stippled on some parts of this. The accompanying description at BL says the map has been pieced together from fragments, which is why it looks a bit like 'Mappa Mundi'. If you look closely at current day Western Road and Middle Deal Road area you will see a mismatch. The join line is visible and it is possible to put it right by disconnecting and rejoining. There is evidence that a team of surveyors were involved as the individual segments have their own styles. This map was before the turnpike was built. This map was consolidated, reduced to 1 inch to 1 mile and engraved at the Tower, printed in 1801 available at (search for Deal) a free online source for historians. It is exactly as the first sketch books but was already out of date because the turnpike had arrived from Dover to Deal and Upper Deal to Sandwich. The tortuous route to Sandwich via Sholden, Finglesham, Ham then Sandwich is shown as a 'major' route! The second map, also from the British Library online gallery, is a finished version of the same map but has been updated with additional detail, revised to about 1815. The Napoleonic war had a big impact on our area in the intervening years and can be seen with the addition to the barracks site at Walmer, the turnpike road through Deal to Sandwich and the explosion in the number of windmills in the Deal area. 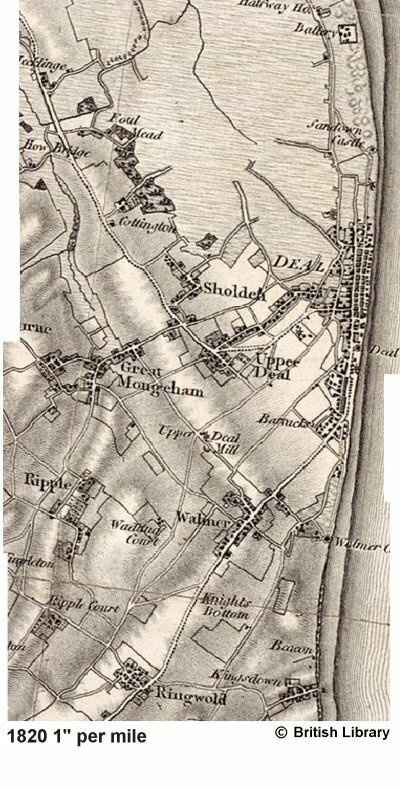 The Dover to Deal and Upper Deal to Sandwich turnpikes were in place but the route from Queen Street to Upper Deal was conjecture as it was not authorised until 1819 by further Act of Parliament, so this route is not exact. 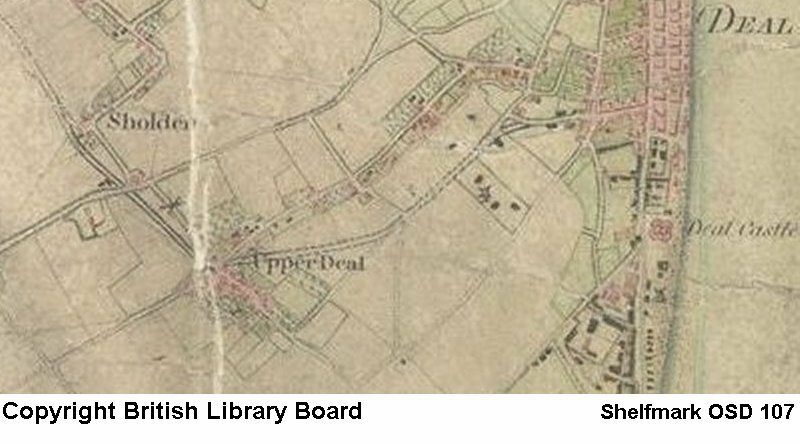 The third map shown right, can be purchased in facsimile, is the Ordnance Survey First Edition 1 inch to 1 mile complete map of East Kent and is the 1819 engraving of the Mudge map. This was updated and revised several times, with railway revisions to 1889, but it is quite clearly uses Mudge's work. This is sheet 81 in the series by David & Charles. There are extensive biographical notes, well worth getting just for this text. The detail is mostly truncated because of the small scale. This original without any updates is available at the 'Vision of Britain' website. It has the wrong route for the turnpike through Deal - the Middle Deal bypass. The tithe map of 1843 (CD from Canterbury Cathedral Archives) is a much larger scale map (25 inches to 1 mile), now showing the outlines of all buildings properly. This map is accurate and can be overlaid on later Ordnance Survey maps to show the incredible accuracy achieved. Residential and commercial properties are differently coloured, with a lot of extra topographical details drawn on the map. The associated Schedule lists owners, occupiers, type of property, use and the value of the tithe. The next widely available large scale map is the Godfrey Edition for Deal 1871 (Kent sheet 58.04) surveyed in 1871, printed in 1873. Originally 25 inches to 1 mile, the reprint is 15 inches to 1 mile. There is a huge amount of detail here and you need a magnifying glass. This is the only map to show the terminus of the Minster to Deal Junction Railway, which arrived in 1847. Plots and buildings are shown but you need to confer with other maps to determine the exact topography. It is widely available at good bookshops. Another large scale revision took place with the 1906 map also at 25 inches to 1 mile. This was used as the basis for the 1910 Inland Revenue survey 'Lloyd George's Little Domesday Book'. This became a unique document with residential properties individually coloured and described in the accompanying field books. It was also added to - a projected housing estate is drawn in pencil with great detail off Marlborough Road, Deal for instance, which never happened. This was also in the era before the mines and the big housing estates up Mill Hill.